Fulgors puled Alfa & Omega's masks without the referee seeing. Participants were all surprises (but all regulars.) Listed in order of entry. 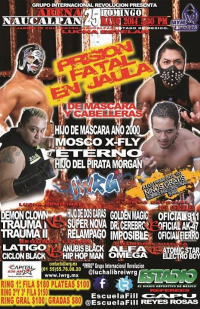 Hijo de Mascara Ano 2000 threw out Pirata Morgan to win. 911, with the Oficials, presented Mascara with the belt - and then the trio beat up Mascara and Cien Jr. Team Cien took 2/3, the last when 911 pulled Mascara Ano's mask. 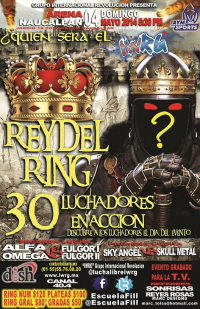 Hip Hop Man and Atomico Star replaced the Fulgors on the rudo side. 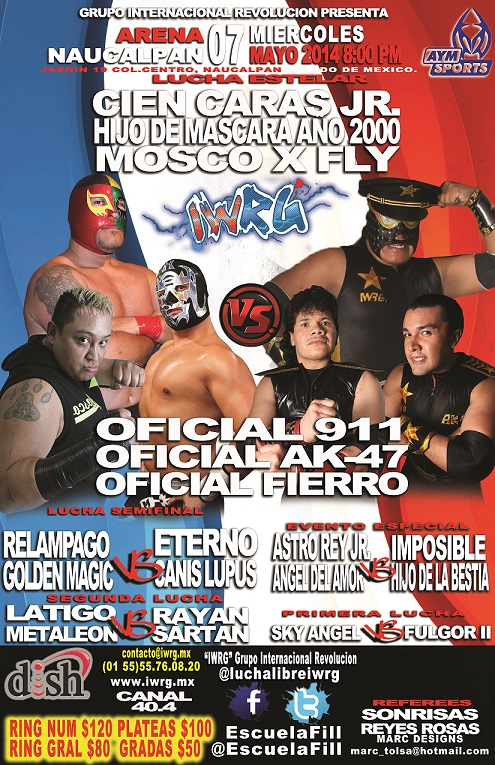 Arana de Plata and Hip Hop Man removed from the match, and Astro Rey moved over to the rudo side. Wagner's first match here since October. Demon Clown's debut. 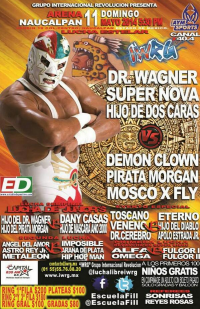 Tecnicos took 1/3, Pirata and Wagner exchanging falls. Hijo de la Bestia had a falling out with his partners. AK47 took 1/3 and demanded a shot at the Rey de Reyes title. 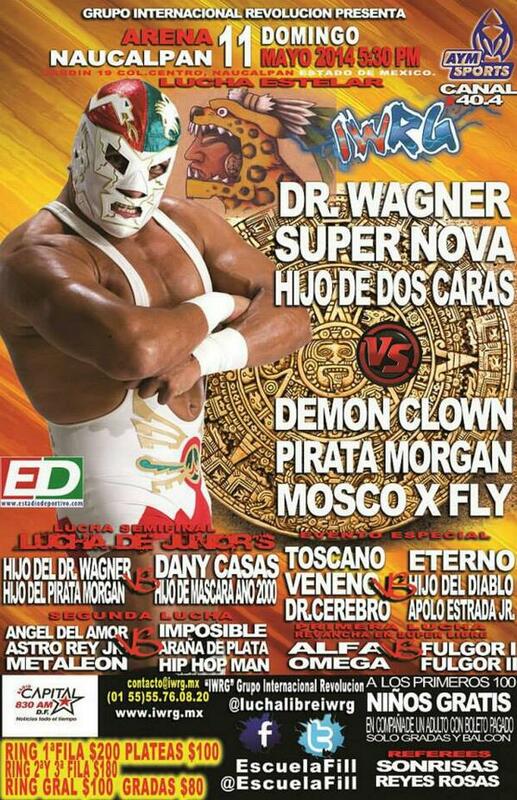 Hijo del Pirata Morgan is getting a shot first, on Sunday. Gringos VIP are champions and kept the titles by taking fall 1/3. Third defense. Gringos want a shot at the tag team titles. Straight falls when Astro Rey Jr. decided he rather be a rudo. He took Latigo's mask after the match. Guerrero Mixtico wants a hair match with Alan Extreme. Straight falls. Apolo faked a foul in the second. Eterno was wearing his Anarquia gear. Demon snuck in a foul on Dos in the third. Hijo de Mascara Ano 2000 is champion. Eterno seconded Pirata, X-Fly seconded Mascara. Pirata took the first, Mascara the second. Ref got knocked down in the third, Mascara put Pirata in a hold, Eterno ran in - and knocked out Pirata, giving Mascara an easy pin. Mascara was unhappy about Eterno getting involved. 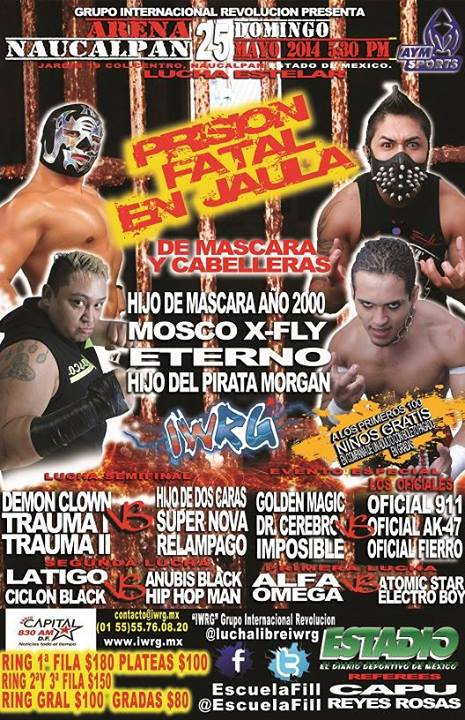 Eterno proposed a four way with Pirata, Mascara, Eterno and X-Fly - and X-Fly attacked Eterno. First defense. Title change! Apolo & Diablo were able to overcome Veneno's holy karate to win the championship. Veneno and Alan fall on third defense. Gringos VIP are 22nd champions. 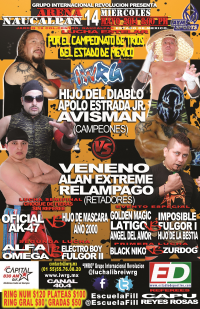 Hijo de Mascara Ano 2000 is the champion, and took falls 1/3 to keep the title, the last with a German suplex. Bestia broke up with the rudos seven days ago. Apolo Estrada seconded Bestia, Eterno seconded Imposible. Bestia was DQed in the first for excessive violence, then Imposible just beat him in the second fall for the rare straight falls mask win. Hijo de la Bestia was announced as Humberto Lopez, from Guadalajara, 32 years old, 15 years a luchador. billed as Alfa & Omega vs Atomic Star & Electro Boy. Omega replaced Anubis Black. 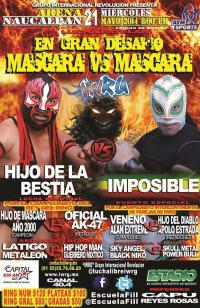 Hip Hop Man challenged Latigo a hair vs mask match. Imposible is a tecnico now for some reason. Tecnicos took 2/3. Rudos took 2/3, Demon Clown pulling Dos' mask and beating him. Everyone was confined in the cage for 10 minutes, then they could just escape. 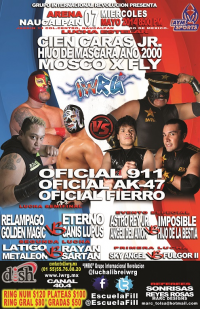 X-Fly used a fork on Eterno. 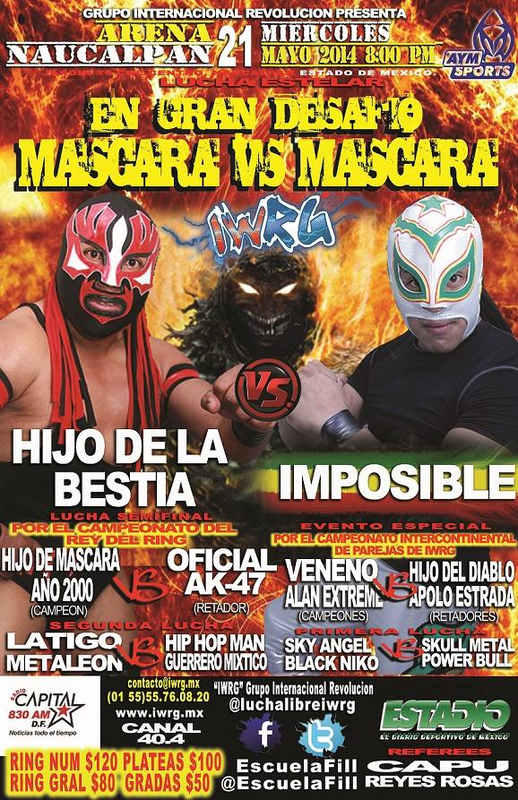 Mascara escaped first, then crowd favorite Eterno. X-Fly tried to escape but Eterno threw powder in his face to force him back down. Pirata narrowly beat X-Fly out. Hip Hop Man unmasked Latigo and pinned him. maestros vs students. One student of each maestro (Terry/Magic, Rivera/Mixtico, Ojo/Impulso, Pantera/Usus, Bombeto/Voltar, Fuerza/Zoom.) Ojo de Tigre was first out. Final eliminations were Rivera (by Mixtico), Black Terry & Guerrero Mixtico DCOR, and Fuerza submitted Magic for the win.